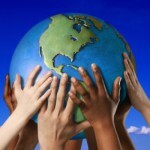 All the waste from the recent Two Oceans marathon was quickly collected, sorted into categories and sent for recycling. The majority of the waste (90 %) was plastic waste (mainly Low Density Polyethylene) used for the energy drink sachets, 8 % was paper (primarily cardboard), and 2 % was metal. 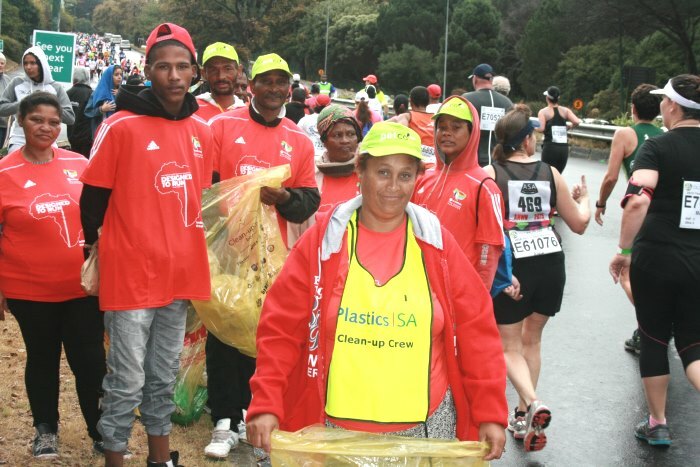 2015 is the 9th year that the Old Mutual Two Oceans Marathon has received assistance in cleaning up the litter from the streets and surrounding countryside left behind by the runners and spectators. According to John Kieser, Sustainability Manager: Plastics|SA and the coordinator of the clean-up teams, the primary goal of their involvement in major sporting events such as the recent Cape Argus cycle race and last week’s Two Oceans marathon, is to ensure that the waste generated by participants and their supporters is collected, removed and recycled as quickly as possible. “The race organizers have set certain goals that are in line with the overall goals of the environmental policy of the marathon. We use sporting events such as these to also raise the public’s awareness on the issue of littering and the need for recycling of waste,” Kieser explains. As with the Cape Argus cycle race, the marathon’s usual route had to be abandoned and planning had to be changed for a route over Ou Kaapse Weg and the suburb of Constantia following the devastating fires that had ravaged the Southern Peninsula at the beginning of March. “The Plastics|SA cleaning crew consisted of 180 workers from the Ocean View, Masipumelela and Joe Slovo settlements. They received in-depth training beforehand on the do’s and don’ts of event greening, and did an excellent job of ensuring that every piece of waste was removed for recycling,” Kieser said. 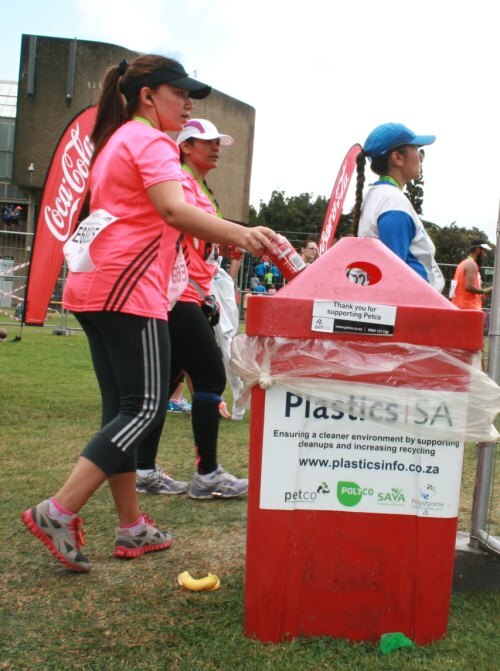 The teams were tasked with focussing their efforts on the waste that was generated at the start and finishing lines, the hospitality park at UCT, litter strewn on the course outside refreshment points and litter left behind in areas of high spectator concentration. 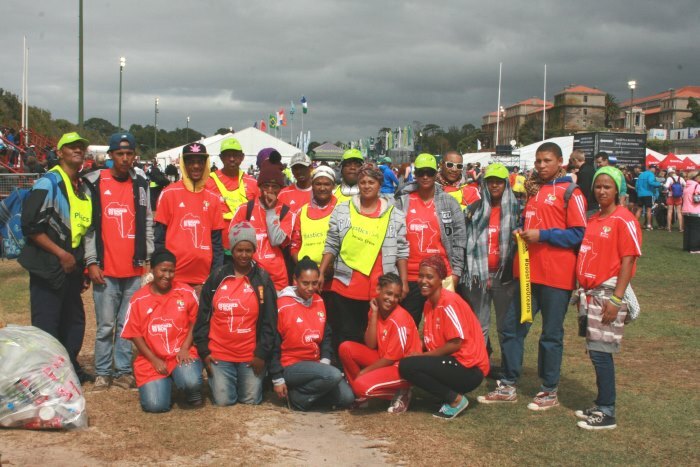 The teams wore highly visible bibs that proudly sported the logo’s of Plastics|SA and its various polymer associations, and were divided into three clean-up crews who began their activities on the 31st of March with pre-event clean-ups, and ended on the 6th of April with a final, post-event clean-sweep of the route. 40 branded bins were also strategically placed at the hospitality/finish area at UCT, as well as provision of branded bibs for the workers. The clean-up teams had to work hard and fast to ensure that the route was cleaned within the time constraints given by the Western Cape Traffic Department. Once all the litter was collected, the crew was also tasked with the responsibility of sorting it into four different material streams, and ensure that bio material (kitchen waste etc.) was separated to streamline the recycling of packaging material by Wasteplan at the Kraaifontein Material Recovery Facility.